The “Master of Suspense”, Alfred Hitchcock (1899-1980), might better be referred to simply, as “The Master”, without further qualification. 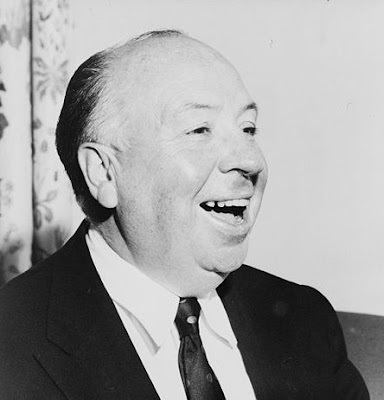 For Alfred Hitchcock so extended and refined his skills in cinematic storytelling throughout his career that he became a comprehensive master of the moviemaking art. This is not to say that every one of his films was a gem. As a prolific director in the area of commercial cinema, where mass-market tastes dictate success or failure, Hitchcock sometimes produced rather pedestrian or hastily-concocted productions. Nevertheless his complete oeuvre displays an astonishing range of technical mastery that invariably lured the viewer into compulsive involvement with his narratives. 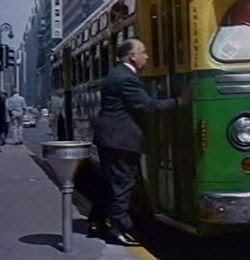 A key to Hitchcock’s work is his adroit use of Expressionistic techniques that extended past the static visual to include the temporal and audial dimensions. In this respect he represents an advancement beyond the pure light-and-shadow work of the German Expressionists who were operating in the black-and-white, silent-film era. Hitchcock was a daring and inventive stylist who still managed to produce a stream of popular films in the mainstream movie business. Early on Hitchcock displayed a highly visual aptitude, and he began working in the British film industry as a title designer in 1920. In 1924 he visited Germany, where he worked as an art-director on the set of F. W. Murnau’s The Last Laugh, (Det Letze Mann, 1924), and his exposure to the vibrant German Expressionistic film culture of that period was undoubtedly influential – Hitchcock has remarked that he was particularly impressed with the work of Murnau and Fritz Lang. In 1926 Hitchcock directed his first feature, The Lodger, and his first foray into the use of sound was Blackmail in 1929. With each succeeding film, he experimented with new, bold effects, and so his style continued to progress throughout his career. In 1933 Hitchcock moved to work for the Gaumont-British Picture Corporation, where he was given even greater latitude. His first film for that company, The Man Who Knew Too Much (1934) displayed many of his later-celebrated stylistic flourishes and narrative techniques that encompassed both Expressionism and Existentialism. One of his enduring Existentialist themes, which is well presented in The Man Who Knew Too Much and runs through many Hitchcock’s subsequent films, is the plight characterized by a mild-mannered man who is suddenly sucked into a whirlpool of danger that comes from only partially revealed antagonists. Loneliness and fear are key ingredients to this narrative line, and the protagonist can only rely on his own resources to save himself. This theme of the menaced ordinary man, the Everyman, evokes a sense of dread that underlies our ordinary existence and is something that resonates with every viewer in some fashion or other. The Man Who Knew Too Much also featured Hitchcock’s famous segmented episodic plot structure that was to be the hallmark of some his greatest films, notably The 39 Steps, Saboteur, and North by Northwest. This narrative technique comprised about six separate episodes in the film, each of which presented a crisis that was resolved by the protagonist’s escape, usually with an additional piece of the puzzle acquired. Each of these episodes was an encapsulated mini-story, with its own dramatic tension and closure, that captured the immediate attention of the audience concerning how it might play out. And yet each one of these little stories followed causally and logically from the narrative consequences of the previous episode – and each led appropriately to the succeeding episode in the story. As a result, the film never lags, and the audience is captive to the immediate activities depicted, while mindful of the overarching theme. “the mechanical element that usually crops up in any story. In crook stories it is almost always the necklace and in spy stories it is most always the papers." "It might be a Scottish name, taken from a story about two men in a train. One man says, 'What's that package up there in the baggage rack?' And the other answers, 'Oh that's a McGuffin.' The first one asks, 'What's a McGuffin?' 'Well,' the other man says, 'It's an apparatus for trapping lions in the Scottish Highlands.' The first man says, 'But there are no lions in the Scottish Highlands,' and the other one answers 'Well, then that's no McGuffin!' So you see, a McGuffin is nothing at all." In The 39 Steps, for example, the MacGuffin could either refer to the mysterious 39 steps, themselves, or it could refer to the missing tip of the villain’s little finger. In fact as colourful as the term might be suggested to be, it has been so overused and variously misapplied by subsequent commentators that it is now more a source of confusion and is best avoided as an explanatory phrase. Hitchcock’s supposed fixation on blondes. Most of the leading female characters in his films have blonde hair. In many of his films, one or more characters is presumably gay or at least has effeminate behavioural characteristics. This leads the critics to suggest that Hitchcock had tendencies in this direction and that there is a gay subtext to many of his films. The principal male character in his films is often subservient to a semi-dominating mother. In my view such critical speculations about Hitchcock’s psyche are circular, and they are as unscientific as the field of psychoanalysis, itself. It is best for the rest of us to stick with the material at hand, the films. These have not been examinations of psychological neuroses, but have dealt with universal human themes, as is evidenced by their widespread appeal across cultures, age-categories, and sociological boundaries. His greatest films, The 39 Steps, Notorious, Vertigo, North by Northwest, Psycho, and The Birds (the last four of these coming in succession and immeasurably enhanced by the music of Bernard Herrmann), reach into the depths of the human soul to evoke feelings of anxiety, desperation, escape, and passion. That is why they stand so high even today. Gottlieb, Sidney (2002). Framing Hitchcock: Selected Essays from the Hitchcock Annual. Detroit: Wayne State University Press. p. 48. ISBN 0-8143-3061-4 . Mogg, Ken, "Alfred Hitchcock", (2005) in Senses of Cinema, http://archive.sensesofcinema.com/contents/directors/05/hitchcock.html.